These are White-Faced ibis, not Sandhill cranes. In Japanese culture, the crane is special. It’s a sign of longevity and good fortune, because it supposedly lives for 1,000 years. In reality, cranes do live long lives. In captivity, their life-span averages 40 to 60 years. Supposedly, one captive Siberian crane lived for 83 years and fathered chicks at age 78. OK, then! Anyway . . . to Aikido’Ka Opening Day. We had classes and other events going all day long. It was quite the extravaganza and tremendous fun. While I was leading a class, I heard a familiar sound and listened carefully. It didn’t take too long for me to think I was hearing Sandhill cranes — a lot of them. I dashed outside and saw circling directly above the dojo a flock of Sandhill cranes. There must have been hundreds of them. The cranes visited several times that day. I’m not superstitious, or anything like that, but I sure did appreciate the visit. 🙂 The cranes don’t show up every year, but they often do. While I can’t guarantee the cranes will appear during our 10th Anniversary Celebration, I can assure you that we’re going to have a great time. Two of my favorite aikido people will be teaching — Michael Friedl Shihan and Kimberly Richardson Sensei. Michael Shihan is my direct aikido teacher. He’s an extraordinary teacher and a great guy — informative, fun, easily approachable. Kimberly Richardson Sensei is an absolute marvel. She moves with extraordinary grace. She’s very friendly and approachable. You’ll love both of them. Getting the two of them with us together is an incredible treat. We’ll also have some other teachers who have been instrumental in our success teach some. We’ll be providing lunch at the dojo. I also understand that Michael Shihan may put on a brief magic show during lunch! On top of all of this fun, Ian Isbell will be doing his shodan test Saturday morning around 10 am. Ian will be our second home-grown black belt. Talk about exciting! 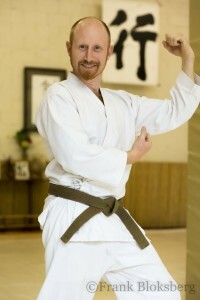 Ian has been training for about 8 years, and is a key member of Aikido’Ka. He’s a really great guy with a truly joyful spirit. Ian will be demonstrating for his shodan on March 10, 2017. 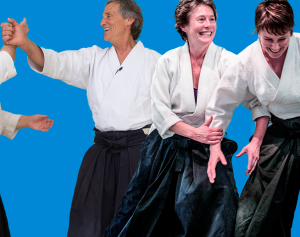 Aikido’Ka is a friendly, fun dojo where you are welcome. So please join us and celebrate! You’ll get a $20 discount if you register before March 3, 2017. CLICK HERE FOR MORE INFORMATION ABOUT OUR 10TH ANNIVERSARY CELEBRATION. By the way, the photo I’ve used with this post is not of Sandhill cranes. They’re White-Faced ibis. Ibis aren’t cranes, but they’re considered “crane-like.” Since I couldn’t find any photos of cranes that I’ve taken, I used this one. I expect to get some crane photos soon and I’ll update this post then.